Mira Lago is a small enclave of a mere twenty-nine detached villa homes. 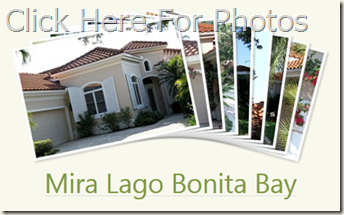 The homes in Mira Lago at Bonita Bay were built between the years of 1996-1998. The community is now built out and there are only resale real estate available. The homes in Mira Lago range from 2,666-4,000 square feet of interior space. The design of the homes offers architectural elements that included barrel tile roofs, climbing bougainvillea, decorative shutters and arched or Palladian windows. Some of the villa homes in Mira Lago have the tropical, entertaining friendly courtyard floor plan, also. Mira Lago consists of only one single street, Mira Way, which is paved a hand set brick paver street lined with mature grandfather oak trees which adds to the charm of the Mira Lago neighborhood. The legal description of Miral Lago is Bonita Bay Unit 33. In addition to the three private community parks within the gates of Bonita Bay, there is a beach park on Hickory Boulevard. The location of Mira Lago is quiet and secluded toward the back of Bonita Bay near the bay, Spring Creek and Spring Creek Park. Communities with similar homes to Mira Lago at Bonita Bay include Bermuda Cove at Bonita Bay, Siena at Bonita Bay and Anchorage at Bonita Bay. Additional amenities of Bonita Bay include a full service marina on the Imperial River, a golf equity that allows play at all of the Bonita Bay courses, fitness, tennis and sports memberships. To learn more about the amenities of Bonita Bay, read also: Bonita Bay Golf and Country Club.